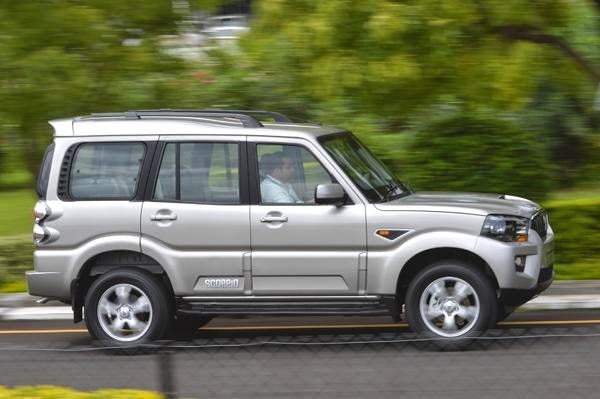 The Mahindra Scorpio has been around for more than a decade. As a result, it’s an SUV that is familiar to most. Over the years, there have been several significant updates - new engines, updated interiors and improved dynamic ability amongst them. 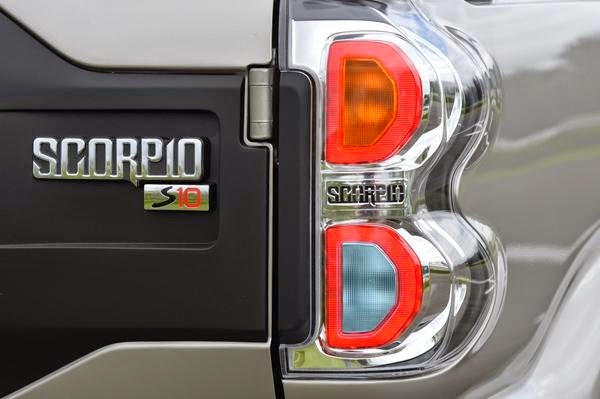 This new Scorpio, however, is more new than just an update. Mahindra & Mahindra’s second-generation Scorpio, the new W105, is a car that is seriously improved – a genuine leap forward over the current generation. So what exactly is new and what’s carried over? 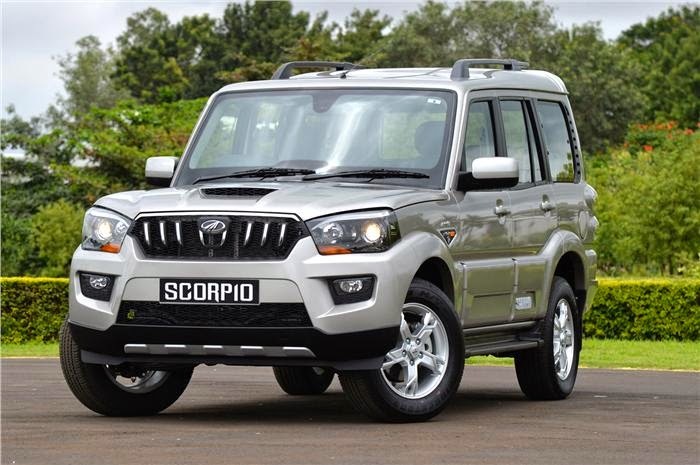 The biggest change on the new Scorpio is the all-new chassis and suspension system, which will also form the basis of a new generation of cars from Mahindra. The new modular chassis is considerably stiffer than the outgoing frame and it is much safer too. The all-new front suspension is lighter and sports service-free hubs, whilst the new rear axle is now supported by a newly added anti-roll bar. The wheelbase is the same, but the Scorpio now sits on a track that is substantially wider. The exterior changes are easier to spot. The doors and roof are carried over, but the all-new front end is what gives the Scorpio its new identity. The traditional fan-shaped grille has been replaced by a more striking and modern one with blade-like chrome slats. There are projector headlamps along with attractive LED ‘eyebrows’, and the all-new bumper seems like it is wrapped around a hidden bull bar. The larger 17-inch alloys look great, but the gap in the wheel arches at the rear means the wheels look smaller than they are. The impressive 118bhp, 2.2-litre mHawk turbo-diesel engine continues to power the car, and you still get the lower-powered 75bhp CRDe-based M2DICR for the lower variants. Also carried over are ABS-equipped brakes, but M&M has now put in its new 5MT320 five-speed manual transmission from the updated Xylo. 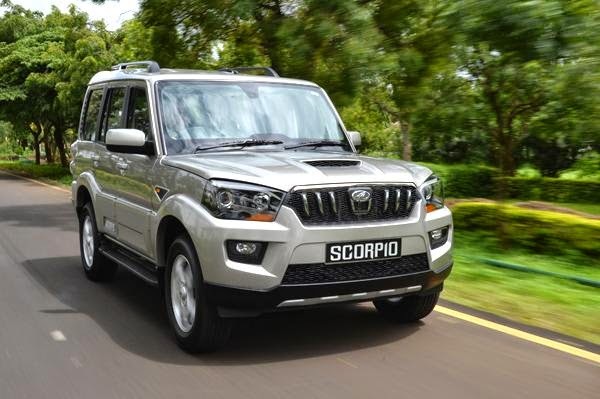 The Scorpio’s interiors have aged faster than the exterior, so it’s just as well that Mahindra has spruced up the cabin with an all-new dashboard, plenty of exciting features and brand new seats. The dash is a neat, clean and angular design with the top of the dash is finished in matte black and the lower half in a nice shade of beige. The power window switches have been shifted from the centre console to a more handy location on the doors, and the fuel filler cover release is also conveniently located behind the steering wheel and metallic highlights inside the cabin look good. There are, however, some cheap-looking bits, like the door handles that you think might break off if you pull them too firmly, and the plastics are still not up to scratch either. Poorly executed joints and seams tell you that overall quality still isn’t quite up to Japanese standards, but in fairness, it’s a big step up from the earlier Scorpio. 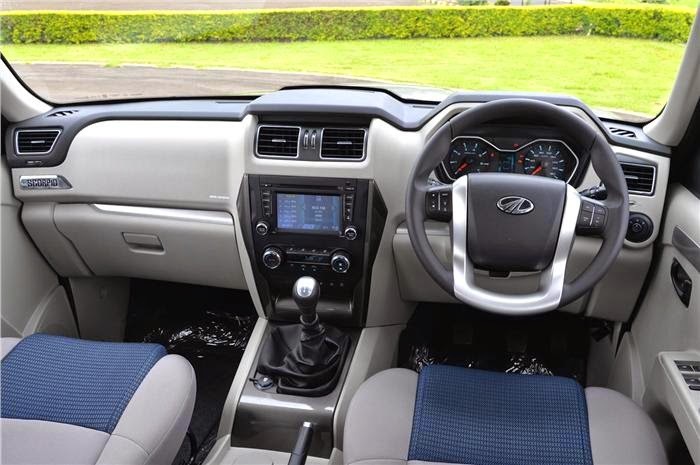 Features that are sure to impress are the six-inch infotainment touchscreen borrowed from the XUV500, an in-built GPS system, temperature and pressure sensors for the tyres, and rear-parking sensors. 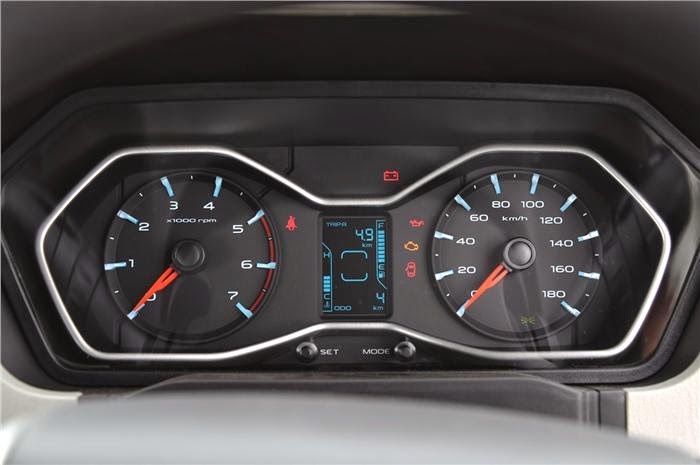 Some versions will even get cruise control and steering-mounted controls on the smaller, sportier steering wheel, also very similar to the one in the XUV. Settle down in the driver’s seat and memories of the earlier car’s poor ergonomics come flooding back. There’s no central locking button on the dash and you have to use the lock on the door handle, which is a bit fidgety. Front passengers will miss storage for bottles; there’s one central bottle holder but that space is where you end up keeping your phone or toll change. A bigger design flaw, however, is the placement of the narrow front seats, which are too close to the doors. Hence, there’s no way you can adjust the driver’s seat comfortably or access stuff from the door pockets without opening the door. The front seats themselves are generously cushioned and quite supportive, although shorter drivers may find an excess of thigh support. M&M has also improved space in the middle row by slimming down the seats and moving them back a bit to carve out more space. The bench seat itself is now more comfortable too, thanks to good thigh support, a high seating position and a finely adjusted backrest angle. The seats, which extend all the way to the doors, are nice and wide, which makes travelling five up fairly comfortable. Our test car came with side-facing jump seats rather than a third row, which isn’t great for safety or comfort, but does the job for short journeys. Mildly retuned and with a different set of gear ratios, the 118bhp mHawk engine has been further honed in the new Scorpio. There's a bit of vibration below 1,000rpm, but low-end response is strong as ever and the Scorpio skips forward effortlessly in a way that belies its weight. Spin the engine harder and there’s a corresponding increase in power as well, which also feels great. This sensation of plenty of torque and power carries on if you shift up early. But past 3,800rpm, the engine starts to strain and gets a bit vocal. 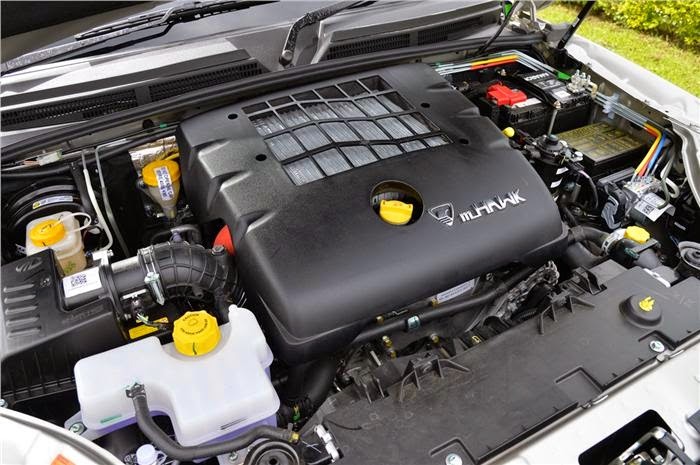 However, the mHawk is pretty smooth for a big diesel; in fact, it’s the most refined engine in its class. There are, however, some vibrations around 2,000rpm, especially when you get off the throttle, but it’s not obtrusive. What’s less than perfect is the gearbox, which feels quite notchy and needs an extra shove to slot through the gate. The clutch is a bit heavy too, so shifting gears in the new Scorpio isn’t exactly fun. The biggest area of improvement, however, is ride and handling. The new chassis and suspension have made a world of a difference to the dynamics of the car. For starters, the ride is better – the stiffer chassis has allowed the engineers to use more supple suspension aggregates. The Scorpio is now really pliant at low speeds and that takes the edge out of the bumps and potholes. The ride is also much flatter and more settled, there’s less pitching and bobbing, and for absolute ride comfort, it comes close to the mighty Innova. It’s only when you gain momentum that this softly sprung SUV has more vertical movement. The wider track has also helped make the new Scorpio feel more planted at high speeds. The Scorpio still gets tossed around a bit, but now it almost never feels unsettled, allowing you to drive with a lot more confidence. The steering is well weighted and has a decent amount of feel, and the Scorpio is now far happier to change direction than before. Yes, you do feel the weight of the tall SUV roll around behind you, and no, you can’t flick it around like a hatchback, but this Scorpio is now so much nicer to drive, it adds hugely to the not inconsiderable appeal of this car. 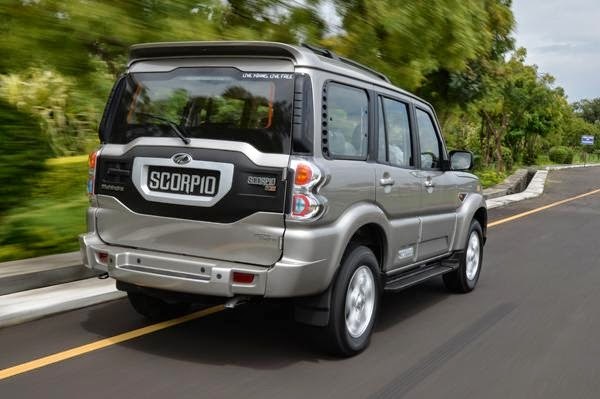 The new Scorpio will be available with two diesel engines. The 2.5-litre m2DiCr engine will power the base S2 trim, while the 2.2-litre mHawk mill will power the S4, S6, S6 Plus, S8 and S10 trims. 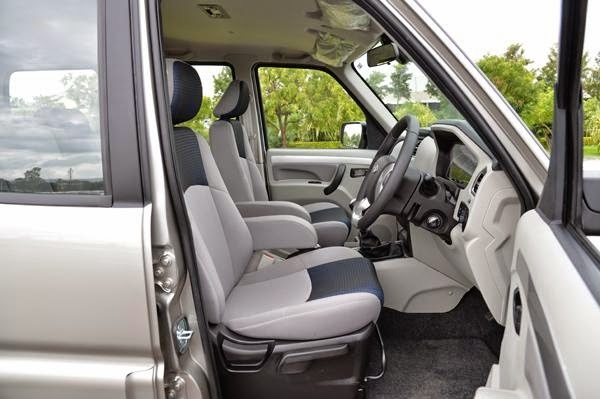 The Mahindra Scorpio S2 trim comes equipped with basic necessities like air-conditioning, power steering, power windows, central locking and 15-inch steel wheels. The next big step up is the S6, which also gets integrated 2-DIN music system, remote central locking, sliding seats for the middle row, rear wiper and defogger. It even gets body colored door handles, wing mirrors, rear spoiler and a roof rack. Mahindra will also offer an S6 Plus trim that gets airbags for the driver and front passenger. The S8 gets electrically adjustable wing mirrors, front fog lamps, projector headlamps, rear parking sensors, a voice assist system, silver skid plate and 17-inch alloy wheels. The loaded S10 tested here gets almost as much kit as an XUV500. You get follow-me-home headlamps, tyre pressure warning system, speed alert system along with rain and light sensors. Also on the S10 is cruise control, steering-mounted audio controls, a touchscreen infotainment system with GPS, automatic climate control and a height-adjustable drivers seat. Additionally, there’s chrome garnishing on the front grille and AC vents along with LED strips on the headlamps. Only the Scorpio S2 and the top-of-the-line Scorpio S10 get Mahindra’s micro hybrid technology. Mahindra is also offering shift-on-fly four-wheel-drive system as a paid option on the S4 and S10 trims; the Scorpio is rear-wheel-drive by default. 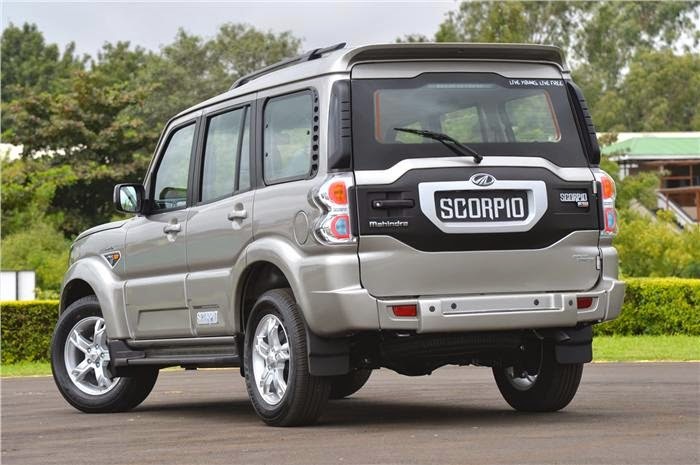 It’s taken M&M a bit of time, but the Indian utility vehicle maker finally seems to have got its Scorpio right. Well, almost. Yes, an all-new body shell would have been nice, a slicker gearbox would have gone down well, and the new car is still heavy at 1820kg. Still, it has improved in almost all areas, and that elevates this SUV to an all-new level. Better to look at, better to sit in and much nicer to drive, the new Scorpio, has what it takes to remain the huge success it’s been, especially now that it's been priced almost the same as the outgoing model - from Rs 7.98-11.46 lakh. This blog is very good this provides a very fast information regarding the latest product.Get ready to win mahindra scorpio s2 by just participating in a simple online contest.